2-Grease a large lasagna dish. 3-Cook the pasta until only firm-tender; drain (it does not have to measure exactly 4 cups cooked, careful not to overcook the pasta as it will cook more in the oven) drain and transfer to a bowl, toss with a couple tablespoons oil to prevent sticking; set aside. 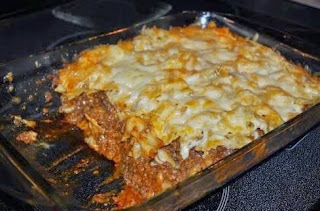 4-In a skillet, cook ground beef, onion, jalapenos (if using) mushrooms and minced garlic until meat is brown and cooked stir in 1/2 cup Parmesan cheese, tomato sauce salt and pepper, stir until heated through (you can the sauce for up to 45 minutes on low heat). 5-Spread 1/2 meat sauce on bottom of pan. 6-Spread 1/2 noodles on top of sauce. 7-Top noodles with 1 cup mozza cheese. 8-Mix 1 cup cottage cheese with 1/2 cup sour cream and 1/2 cup Parmesan cheese. 10-Top with remaining tomato sauce, noodles,and remaining mozza cheese. 11-Sprinkle with remaining 1/2 cup Parmesan cheese. 12-Bake, covered for 20 mins, uncover casserole (at this point you can sprinkle with grated mozzeralla or cheddar cheese if desired).